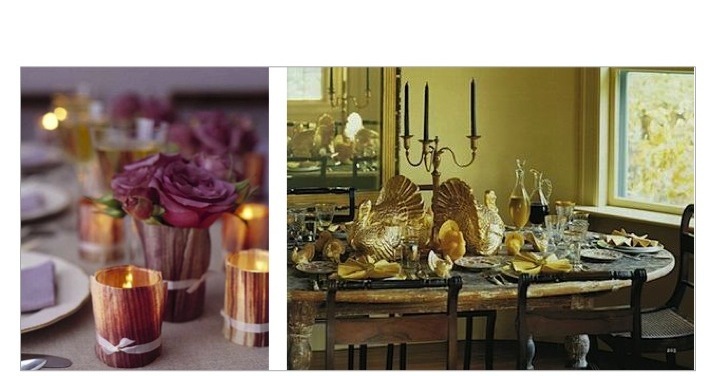 DESIGNER WEEKENDS: THANKSGIVING TABLE LIGHTING! Many Americans have spent the last year dreaming of homemade stuffing and pumpkin pie. Finally, Thanksgiving is just around the corner! Hopefully you’ve reserved your bird, invited friends and family around, and dug out your favorite holiday recipes. But have you thought about how to set your dining table? We’ve dedicated Design 101 this month to interior lighting. Below are tips and tricks for setting up the perfectly lit dining table to complete your Thanksgiving feast! Have you ever noticed how cozy most fine dining restaurants are? Lighting has a lot to do with it. Think about how different the lighting experience is when you go to a fast food restaurant, where it’s light and bright, compared to a special night out at a local dine-in restaurant. One uses lighting (and very often uncomfortable furniture) to keep the crowd moving; the other uses lighting (and plusher furniture) so you want to stay a while. You can use lighting to create an inviting and cozy space in your own dining room! The best way to create a mood is to install dimmers on your light switches. That way you can set the light fixtures at a lower setting during your meal. If you don’t have dimmers, try replacing light bulbs with bulbs that are 25 – 40 watts for a soft, warm glow. For additional light filtering, we often add lampshades to chandeliers and sconces so your guests aren’t staring at bare light bulbs. If you’ve ever looked at yourself in the mirror of an airport bathroom you know how unflattering harsh overhead light can be. Oh, the bags under your eyes! Lighting that hits you face-on is much more flattering. Take a trick from restaurants and balance out overhead lighting by using candles. Candles will cast a flattering glow on all of your guests, while also telling everyone that you have made a special effort with the meal. There are a number of candle types, and all are an affordable way to make a big impact on your dining table. Tapered candles are tall, thin candles that taper at the top. These are appropriate for all occasions casual and formal. If you’re setting a casual table, try displaying tapered candles in individual candlesticks. For a more formal look, candelabras can add a bit of luxury. Pillar candles are cylindrical and are available in various widths and heights. We like to use pillar candles in multiples and a centerpiece or in stylish glass hurricanes. If you don’t have anything that will hold a pillar candle, try tying a pretty flower, or other botanical object, to each with some pretty ribbon. Votives and tea lights are low candles that look great as multiples in pretty glasses or as part of a larger arrangement. 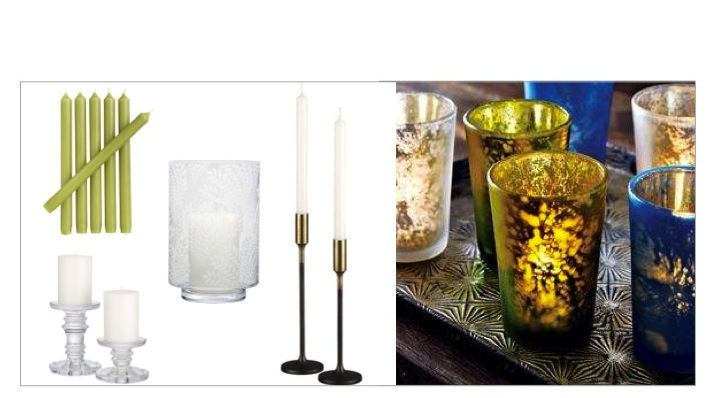 We like mixing and matching textures, patterns, and styles for votive holders to create an eclectic look. You could also fill a vase or hurricane with rocks, shells, or botanicals, and place a votive in the center. Floating candles offer a simple way to add a little drama to your table. Just find a pretty glass bowl, fill it part way with water, and add the candles. We like to float some seasonal flower buds in the bowl as well for an added decorative detail. Go for unscented candles. You don’t want a candle fragrance competing with the smell of fresh cooked turkey! If you’re nervous about using open flames around children or animals, try battery-powered candles. Never leave a burning flame unattended or close to anything that could catch fire. Trim candlewicks to about ¼” before you light them to keep a controlled flame. Try to keep candles above or below eye level so they don’t disrupt conversation. It has been said however, in order not to embarrass those who could not afford electricity; it was considered a polite gesture to burn the wicks of the candles on display so it was not known who had electricity… and who did not. Vote for Us - Top 100 Design Blogs!